Birds love fresh, dry seed. But not all birds love the same seeds equally. I have made it my business to study the birds in my own yard, using 12 bird feeding stations as my test ground. 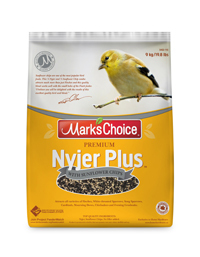 I can report that the two Mark’s Choice Finch Feeders that I have been filling with Nyjer Plus seed have required filling as least once every week all year long. They just seem to love the stuff! This mix of 1/2 nyjer and 1/2 sunflower hearts will attract more than finches. It will also attract white throated sparrows, song sparrows and chickadees.